All of our properties are privately owned. We do our best to make your stay a comfortable and enjoyable one. We do have a few guidelines that must be followed in order to accomplish that. Guests arriving after business hours must contact the office on day of arrival to make arrangements for key pick up. The first night plus tax will be charged to your Visa, MasterCard account to guarantee your reservations. Our Cancellation policy for our condos is 14 days prior to day of arrival and a $25.00 fee will be imposed. Within the 14 days the full deposit amount is forfeited. Guests shall be responsible for any property damage, accident, death or injury to any person, or loss of property sustained by any person, including loss of money, jewelry other items or personal property. Most of the properties are NON smoking and some properties will allow pets. Please inquire before making a reservation. 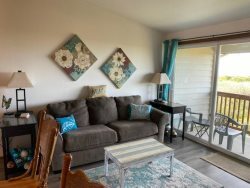 NO parties, receptions, large gatherings, weddings, or the like allowed in any of the vacation rentals without written authorization and applicable deposits and fees. Please check the property and report any damages upon arrival. If we are not notified promptly after arrival you may be held responsible for any damages that are found. We are not responsible for failure of appliances, Hot Tubs, or Hot water heaters. We will make every effort to have repairs done promptly. Hot Tub properties are USE AT YOUR OWN RISK. At The Beach Family Vacation Rentals, Inc. or the property owners are not responsible for the Hot Tubs. They are maintained regularly but some people have different reactions to the chemicals used to maintain them. No one under 18 years of age allowed in Hot Tubs. Quiet times are between 10:00 p.m. and 9:00 a.m. If you are disruptive of other guests you may be evicted without a refund. Please turn off all heat, lights and TV's and make sure all doors and windows are closed and locked upon departure. There is no daily maid service available for the vacation rentals, the units will be cleaned after your departure. Please print and sign this page stating you have read and understand the rules and policies described above. Click here for a printable version of this agreement.